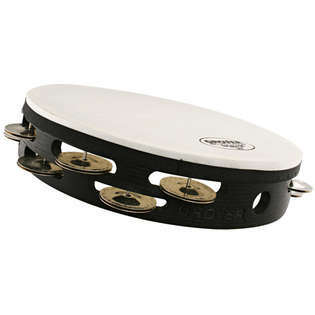 The Grover Pro Tunable Tambourine affords players who prefer a natural skin head the ability to maintain a consistent head tension regardless of the temperature and humidity. Grover's titanium tuning pins grant players a tuning range not previously possible with professional-level tambourines. The patent-pending design produces no extra bulk and negligible extra weight because the tuning mechanism is completely internal. In addition to being tunable, the Grover Pro Tunable Tambourine is customizable: The 18 jingles of the top row are interchangeable, allowing for an unbelievable number of different combinations to customize your sound. Jingle Packs sold separately. NOTE: Do not over-tension the head. Always lower the tension of the head after playing to ensure the head is not damaged if the weather changes!